Home SlideshowWhy Sinking your Teeth into a Cronut is Dangerous! Why Sinking your Teeth into a Cronut is Dangerous! 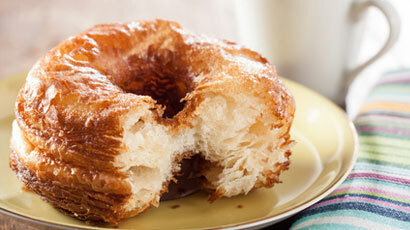 Cronuts are fast becoming a favorite with people all over America, especially among those who have a sweet tooth. For those of you, who have no idea what this word really means, a Cronut is a hybrid pastry that you get when a Croissant meets a Donut. This newly launched sugary creation should definitely not be mistaken for simple deep-fried croissant dough. Cronuts, made from laminated dough, are proofed and fried in a specific type of oil for 30 seconds. Next, their sides are rolled in granulated sugar. The pastry is then filled with cream and finally, it is glazed at the top! These dear treats have a very short shelf life and are only available at one store. However, there is a flipside to Cronuts, which are often referred to, as a “Nutritional Nightmare” by fitness enthusiasts. Needless to say, fried croissant pastry filled with sweetened cream and topped with sugar is bound to be a no-no for any weight-watcher. To make matters worse, the creator of this sinful delight neither shares his secret recipe, nor discloses its calorie count or nutritional value. Though, he does admit that his decadent delicacy contains fairly high amounts of butter, cream and sugar. Many Cronut fans have stated that it is “totally worth the calories” but perhaps cronut maniacs may not really be the best judge of that. Let’s take a look at the nutrients you are probably taking in, as you bite into a Cronut. Normally, a plain medium-sized donut, without any filling contains approximately 200 calories. Around 48% of that comes from Fat and another 47% comes from Carbs; only 5% comes from Protein. Unfortunately, the nutritional value of the croissant doesn't look any better. Depending upon the recipe that is used, a plain medium-sized croissant contains approximately 231 calories, of which 47% comes from Fat, 45% comes from carbs and only 8% comes from Protein. Just looking at the ingredients of this light, flaky pastry, fitness gurus guess that a single Cronut contains around 400 calories, and about 50% of them come from saturated Fat! Therefore, if you are into healthy eating and living, a Cronut should probably be high up on your “Not To-Do” List. Not only is it very high in calories, its nutritional value is considerably low. People suffering from health problems like high cholesterol, diabetes, obesity, hypertension or cardiovascular diseases had best stay miles away from this rich dessert. Does this mean that you will land up in the hospital for eating one Cronut? No, not necessarily (unless you are suffering from diabetes or high cholesterol)! Even fitness freaks have been known to indulge in some high-fat, high-calorie food once in a while, just to satisfy their cravings. However, making food items like Cronuts a regular part of your diet could spell serious trouble. When it comes to regular dietary choices, always try to opt for foods that are natural, as they usually contain lower amounts of fat, sugar and salt. If you are not sure about any particular food item, just check with a nutritionist!